High Style Chinoiserie for the powder room! for beautiful chinoiserie (or other high style) wallpapers, fabrics, and finishes. go for the silk roman shades, the marble counter, gorgeous pair of sconces, etc. but might not like in larger doses for a big room. My own powder room is teeny tiny. I would never go Plain Jane in a space this small. Here is a detail of my sconce and mirror. Which set against a scenic chinoiserie toile paper, causes the eye to travel. nature of the yellow and muted green scenic paper. 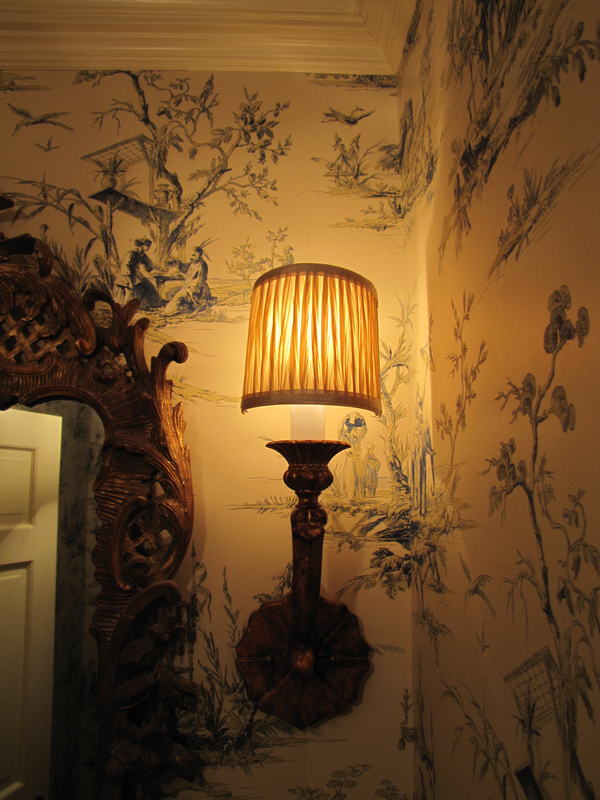 Let’s look at some other fabulous chinoiserie powder rooms that may give you some ideas. More scenic paper, see anything you like? is a little “too-too” for me. Remember the “decide what is most important” rule? trio of fabulous wallpaper, gorgeous rock crystal sconces and ornate mirror take center stage. Together, it just way too much ornateness. All is forgiven, though, by use of the handpainted Gracie silvered scenic, which is divine. And here, below, see how the plain counter allows the ornateness of the mirror to shine? This entry was posted on January 8, 2013 by Ellen at Color Calling. It was filed under Chinoiserie, Decorating trends, Mirrors, Residential styling .